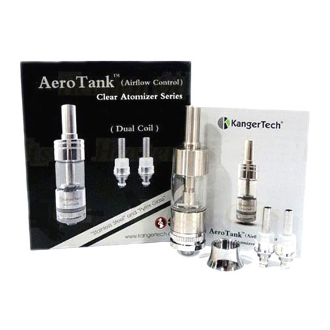 The Kanger Aerotank Dual Coil Clearomizer offers the same great features and performance as the Kanger Protank 3, but with the introduction of all stainless steel material made with dual coil heads inside! The Aerotank continues to use the popular 510 thread. New features include Airflow control base, Food grade Stainless steel body, Pyrex tank is replaceable, Glue Free replaceable parts, Replaceable Atomizer Heads (same ones as for Protank 3), and 2.5ml capacity.